She makes an essential point, that may account for the intensity of reaction to any questioning of our current paradigm of mental illness. Questioning of the language may be heard as a denial of an individual's experience of suffering. Can we recognize that the suffering is real, without calling it an "illness" or a "disease?" How is her twitter follower right? When we recognize that from the moment we are born, our behavior and emotions are a vehicle for communication and for making sense of our experience, we can understand behaviors associated with ADHD not as an illness, but as a form of communication. 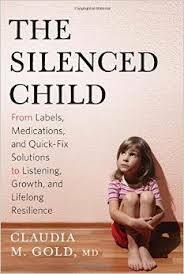 As I describe in my book The Silenced Child, the problem comes when rather than listening to the meaning of that communication, we instead silence the communication either with behavior "management" or medication. For if behaviors serve an adaptive function, are actually a way of coping or holding ourselves together, eliminating the symptoms might be a short-term solution. While medication can have a role to play in relief of profound emotional suffering, if we fail to offer ample time and space to listen for the meaning of behavior, we should not be surprised if "symptoms" reappear in different and sometimes more problematic forms. “But its genetic” or “these are brain diseases,” are frequent response to this reframing of our concepts of mental wellness and illness. Once we recognize that our genes, brains, and bodies develop in relationships, the false duality of biology and experience, of nature and nurture collapses. Expression of our genes and wiring of our brains occurs in the interactive process of mismatch and repair in our closest relationships starting from birth. It used to be thought that brain wiring was pre-determined; that our brains had a fixed wiring plan. But now we know this is not true. Formation of new neural connections- the “wires” that make up the brain- is flexible not only in early development, but throughout our lifespan. When we move through the experience of disconnection to moments of connection and healing, we grow and change. Relief of emotional suffering lies not in naming and eliminating problematic behavior, but in creating ample opportunity for a mosaic of social connection, with all its inherent messiness and disorder.